According to education website Education.com, kids generally spend around 4,000 hours in classrooms between kindergarten and the third grade, while babies spend as many as 12,000 hours in childcare facilities. Research shows that environments impact on our intellectual, social and physical development, and when you consider the amount of kids’ time that’s taken up in nurseries and kindergartens, it makes sense that creative architecture and design can be pretty significant. As the National Scientific Council of the Developing Child puts it, “Just as a lack of the right materials can result in blueprints that change, the lack of appropriate experiences can lead to alterations in genetic plans.” With this in mind, let’s take a look at 10 inspiring kindergarten buildings from around the world. Located in the western suburbs of Paris, France, Crèche de la Girafe certainly stands out from the surrounding buildings. Completed in 2012, this childcare center was designed by Paris-based architectural firm Hondelatte Laporte Architects. The idea behind the design was to create a building that looked as if it was influenced by a child’s imagination. The massive giraffe pictured above isn’t the only animal incorporated into the building’s design: a polar bear stands guard in the playground, and ladybugs scamper up the front of the structure. What kid wouldn’t enjoy walking between the giraffe’s stately legs whilst on their way to and from class? Crèche de la Girafe not only brings the urban jungle to life, it also offers students a playful storybook environment in which to learn and play. The outdoor covered playground acts as the building’s focal point and suggests that play is an integral part of the learning process. This play area also connects the classrooms, kitchen and gym via the kindergarten’s colorful corridors. And thanks to movable partitions, classrooms can be linked to form larger spaces for group activities. The facility is for children aged up to three years old and was commissioned by the city hall of Albolote. Built around a tree, this striking kindergarten building was designed by Tokyo-based Tezuka Architects in 2007. The building is part of Fuji Kindergarten, which is situated in the west Tokyo city of Tachikawa. Resembling a treehouse, the environment was created as a safe place for children to play in and wait for the school bus – and it also doubles as a space for English language classes. Fagerborg Kindergarten in Oslo, Norway combines a rustic, wooden outer design with bright, airy, modern interiors and light-filled stairways. The work of local architectural firm Reiulf Ramstad Architects, the building was completed in 2011 and was designed to create a stimulating atmosphere for young students. Its unusual shape and scattered windows foster a warm and playful environment. The design is sure to help make a child’s first educational experience away from their family a positive one, while the surroundings and architecture could well have a positive effect on their development. The building includes four classrooms – two for children aged one to three, and two for three- to six-year-olds. Plus, the site has a common area and a kitchen as well as an outdoor space to encourage playing in the open air. The colorful and unique kindergarten known as Els Colors Nursery is located in the municipality of Manlleu, in Barcelona, Spain. Completed in 2002, the building was conceived by Catalonian RCR Architects. The design is relatively simple, yet it’s RCR’s creative use of color that really brings the place to life. The combination of colored glass walls and long hallways makes Els Colors practically brim with possibilities and energy. It’s a cheerful, imaginative and pleasantly spacious area where children can let their imaginations blossom. Even the wall heights are specifically tailored to a child’s perspective, creating a fun environment that’s quite different to the adult world kids inhabit. Thanks to a playful design that includes rainbow colors and oversized pencils, Aadharshila Vatika Kindergarten in Delhi, India almost looks as though it belongs in a cartoon. Space Architects came up with the design, and it was completed in 2007. The kindergarten is intended for children between two and a half and five years of age, and as well as classrooms, it features an activity room, a medical office and a dance and music area. Kindergarten Wolfartsweier in Karlsruhe, Germany is one cool cat of an educational center. Renowned French artist and writer Jean-Thomas “Tomi” Ungerer designed the unique structure in partnership with architect Ayla Suzan Yöndel. Children enter the school through the mouth of the cat and can exit via a slide – which looks delightfully like a tail – at the back. A welcoming red carpet represents the cat’s tongue, while natural daylight fills the building by way of the feline’s round eyes. Opened in February 2002, after roughly a year of construction, the kindergarten is playful, bright and plastered with artwork. Classrooms, a lunch hall and a cloakroom sit inside the belly of the cat, the main room is found in the animal’s head, and there’s a play area at the rear of the building. Sarreguemines Nursery is located in the commune that gives it its name in Lorraine, northeastern France. The building is designed to mimic a human cell, and it features curved shapes, with harsh edges notably absent. Inside, the kindergarten is characterized by light, sweeping walls and varying ceiling heights. Light shades of pink give the building an intentionally womb-like feel, and the idea of safety, calmness and protection is underlined by the emphasis on organic, curved lines. Architects Michel Grasso and Paul Le Quernec designed Sarreguemines Nursery. Each playroom has its own outdoor area, and there’s a circular lobby in the center of the structure. Despite being situated next to a busy road, this kindergarten is a safe haven where kids can enjoy playing and learning in a tranquil environment. SAKO architects designed this donut-shaped kindergarten in the Chinese city of Tianjin. Completed in 2012, the three-story structure is color-coded – a pretty cool idea. As well as creating an aesthetically pleasing space in which to play and study, the color-coding provides children with an important locational frame of reference in the facility. Rounded edges and bright colored pillars add a sense of movement and cheer to Loop Kindergarten, while windows and glass walls afford the classrooms ample natural light. Meanwhile, the roof of the building is covered with artificial grass and offers additional playground space. Kindergarten plays an important role in helping children to gain social skills, and this inspiring example supplies plenty of room for kids to run around in, use their imaginations and make friends. Ecole Maternelle Pajol is located on Rue Pajol in Paris, France. In 2011, the building underwent major renovations in order to transform the 1940s structure into the beautiful kindergarten we see today. 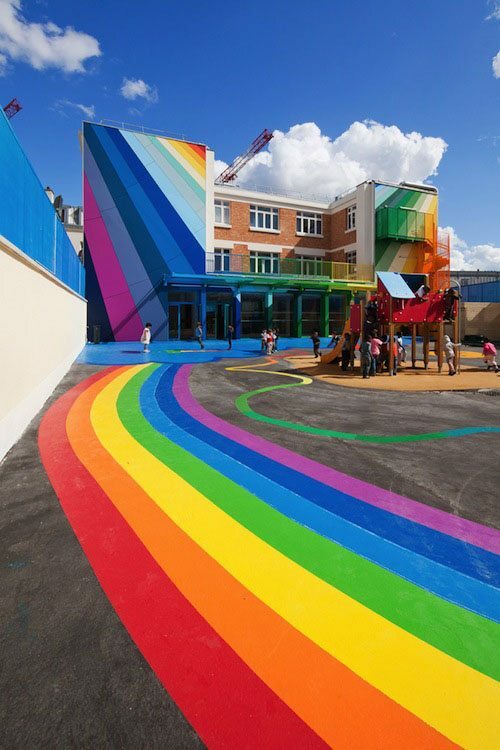 Rainbow colors explode across the ground and the side of the building, making for a play area that really catches the eye – and captures the imagination. The interior is no less vibrant and features a range of geometric shapes as well as lots of different textures – including rubber, metal and wood – to inspire and stimulate children’s senses. There’s even a bit of fun in the bathroom, with snail-shaped dividers used to separate each lavatory. French architectural firm Palatre & Leclère carried out the renovations, and according to architect Olivier Palatre, the goal of the overhaul was to create an environment that would inspire and support both kids and staff.